This chap is quite a character in Copenhagen. 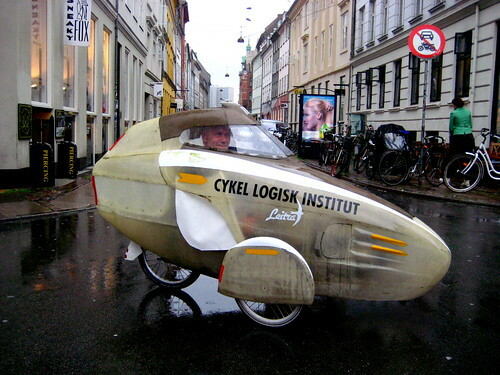 He's a passionate cyclist and Copenhagener and through his Cykel logisk Institut [Cycle-logical Institute] he has been campaigning for years for better cycling conditions for cyclists. Holger Rene Jørgensen is the name. His primary focus is on the development of traffic roofs - covering the main thoroughfares with glass roofs to create 'year-round' cycle and pedestrian streets. A simple idea, really. And so often the simple, obvious ideas never get off the ground. Such a shame. This is a typical street in Copenhagen. It's not hard to imagine a glass roof covering this stretch - just as an example of what Holger is aiming for. He has proposed covering the main stretches of city streets that have a heavy bike traffic and creating a covered network between prime locations such as the city centre and the university, as well as the neighbourhoods surrounding the centre. 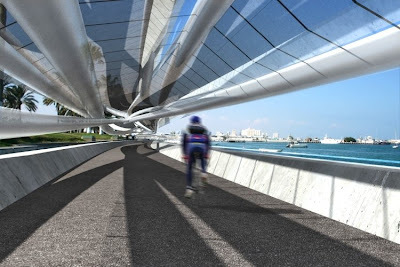 Not only would the roofs create fine cycling conditions in the winter, they would serve to create more liveable spaces for pedestrians and the locals. I asked him for a photo and we ended up chatting in the middle of the rainy street. He mentioned his traffic roofs, of course, and he mentioned something we've blogged about previously - namely a proposed cycle tunnel in Bodø, Northern Norway. He also told me about the Emir of Qatar's plans for a 30 km long cycle tunnel aimed at encouraging Qatarians to ride and reduce obesity. We found this article about it. Tinted glass against the sun and cooled by water running through pipes below. Cycle tunnels are nothing new. This photo from Holger's website shows an old Dutch plan for covered bike lanes. 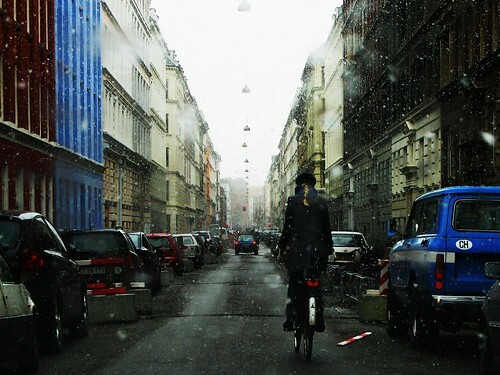 Methinks there is a whole unexplored world of cycling goodness in this simple, wonderful idea.